2-8-15 – Lots Of Holes! I made way for the big lake while the snow was flying. 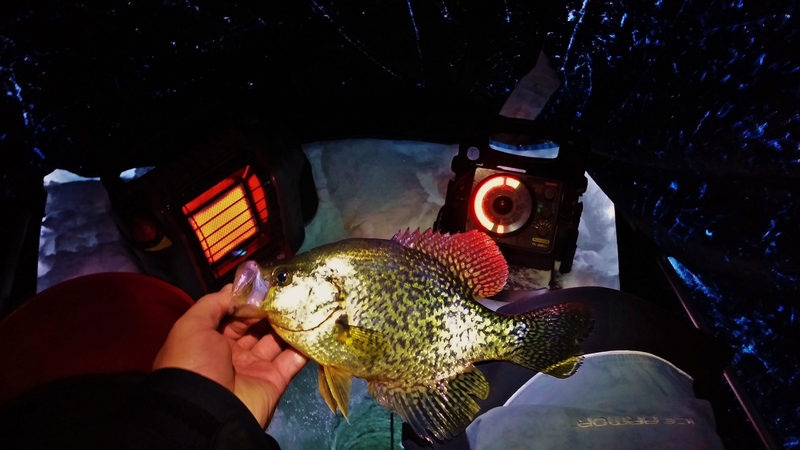 I intended to set up in the dark with the Hydro Glow for crappie but struck out after forgetting my wallet and having to back track. With only an hour till day light and no starting point, I cut a short string of holes hoping that one would offer decent weeds. None of the holes looked great but I set up in the only one that had decent weeds. They were standing about 4 feet tall in 9 feet of water. While I only stuck one fish before sunrise, I saw several fish marking high so I figured I was in the right area. As I started to see daylight through my Clam one man shack, I decided it was time to shred the area in search of fish. After cutting out a rather large area, I grabbed my camera and started looking around. I went nearly an hour and a half without seeing much more than a few pumpkinseed. I knew something was off so I started cutting in other directions. I tried south and west first but finally found some crappie set up to the north of my initial location. I shacked up after locating a nice pod of fish and tried my luck. I caught one within a few minutes and then another. The third fish, however, was a heart breaker. As the two pound black poked into my hole, I realized that it had wrapped up in my transducer. When I tried to remedy the situation, it backed out of the hole and made a run, snapping my line. For a while the bite got tough. Be it a lack of fish or lack of focus. I ended up staying close to the one hole that produced crappie and caught a total of 7 more before calling it quits around noon to get home before the roads got much worse!